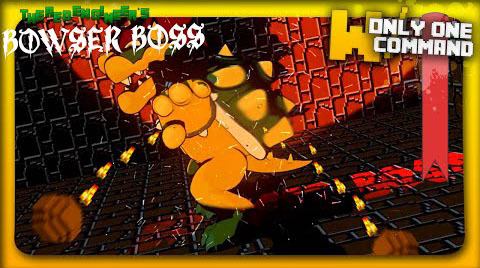 Minecraft Bowser Boss fight with only one command block. It’s a Minecraft Mario Bowser Boss Fight! This one command creation adds bowser in minecraft and has you fighting him to keep him from princess Peach! If you win, you get some sweet new gear to show the world! You have to place 3 command blocks on top of each other and paste the 1st command in the bottom one, the 2nd command in the middle one and the 3rd command in the upper one.